These honeycomb bites are so satisfying to make- watching the mixture bubble and expand and then go so crunchy and crispy is really cool. 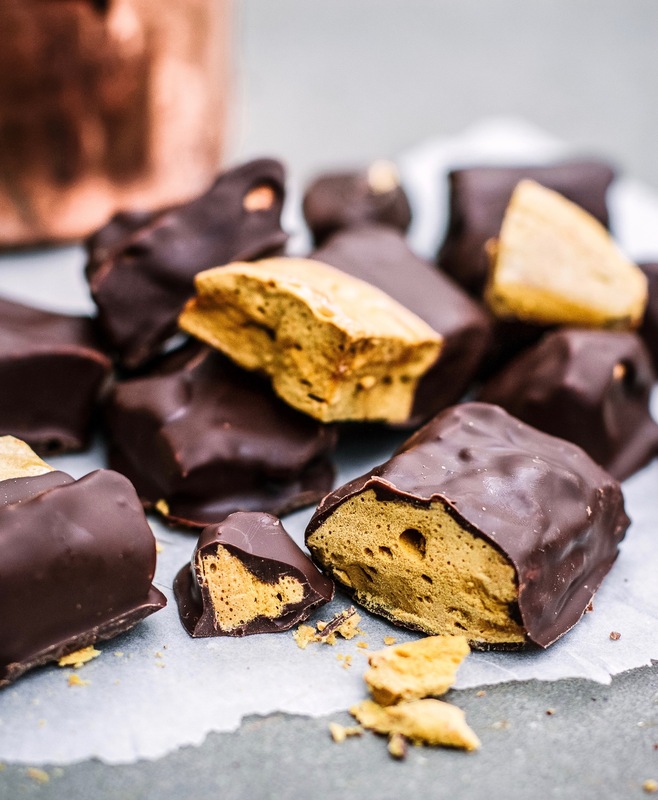 I make the chunks small and use quite dark chocolate as they’re very sweet and indulgent but if you’re a Crunchie fan they’re a must try! Add the honey to a medium saucepan on medium-low heat, followed by the coconut sugar. Stir just until mixed. Let it cook for about 5-7 minutes, stirring only when necessary, until all of the sugar has dissolved. When it’s dissolved the mixture should be very runny and have no grains if you taste it. Once it’s dissolved, turn the heat up until the mixture is bubbling, then remove it from the heat. Use a fork to mix in the baking soda, the mixture will double or triple in size. Make sure there are absolutely no lumps of powder. Quickly (the mixture will stiffen and stick) pour the mixture into your lined tin. Pop it in the freezer for about 30 minutes to set. Melt your chocolate over a bain marie. 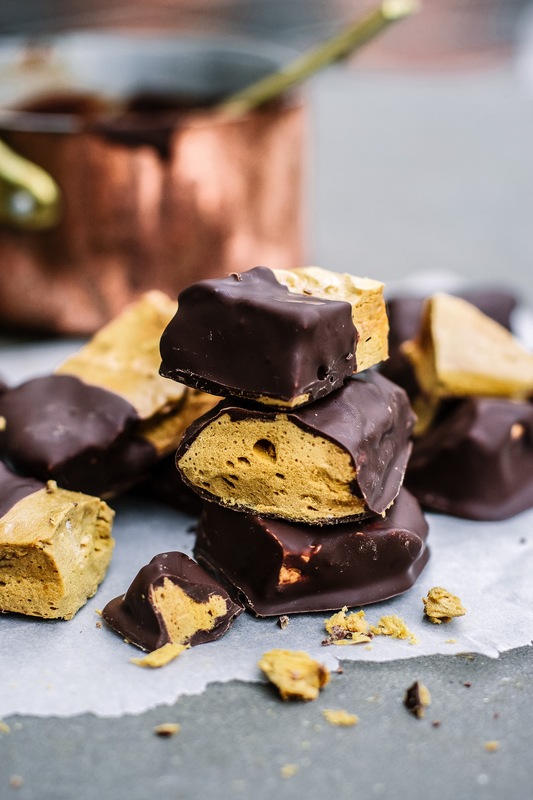 When the honeycomb is set (if it’s still sticky at the bottom leave it a little longer), smash or chop it into chunks or squares and coat in the dark chocolate. Leave them to set in the fridge. Hey 🙂 Just wondering would agave syrup work instead of honey ? Hi, Re baking soda, I’ve been looking for this because some of the overseas online recipes use it for banana bread. You can get an arm and hammer baking soda I see. But it’s not readily available in Ireland. Is bicarbonate of soda the exact same? Thanks. What size tin would you recommend for this recipe please? Would Would maple syrup work instead of honey to make it vegan? I can’t get coconut sugar can I use regular caster sugar?